I harvested the first head of Sweetie Baby Romaine last Friday, nearly 4 months exactly from the date that I sowed the seeds. I'm trying to keep better track of sowing and harvesting dates this year to see how long it takes to produce a crop of a particular vegetable. Four months seems like a long time to produce a small head of lettuce, but I suppose it's not bad considering that they have been growing out in the open through the coldest (theoretically) and shortest days of the year. This head came in at 1.25 pounds straight from the garden and after I trimmed off the tough outer leaves it weighed 14 ounces. 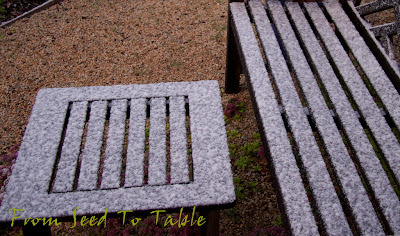 That was Friday afternoon and on Saturday morning here's what I found on that little table where I often place veggies straight from the garden for a little photo shoot... snow! OK, I know, that's not very much. 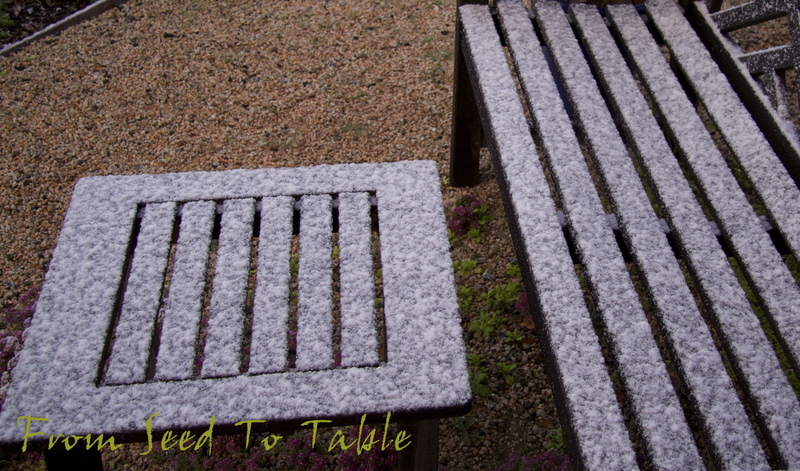 But, if I could remember far enough back to count the number of times I've seen snow in my gardens over the years that I've been gardening it would doubtless take less than all the fingers on one hand, it just doesn't happen very often around here. 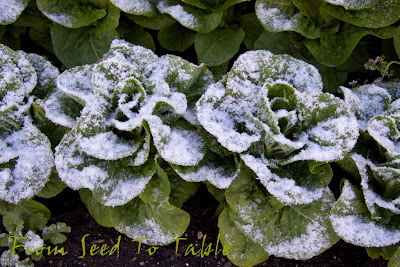 Here's some Sweetie Baby Romaine looking like they've been made extra sweet with a dusting of sugar. 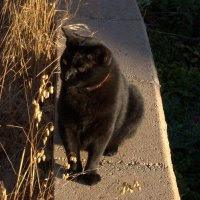 The snow melted as soon as the sun popped up over the hill, but it was fun to see and didn't do any damage in the garden. I was far more concerned when the skies cleared and the cold air mass stuck around. The Meyer lemon tree is shrouded once again with frost cloth. Speaking of frosty things, I pulled a bag of frozen Chocolate Stripes tomatoes out of the freezer last week. These went into the freezer whole last September the day before I left for a 3 week trip. 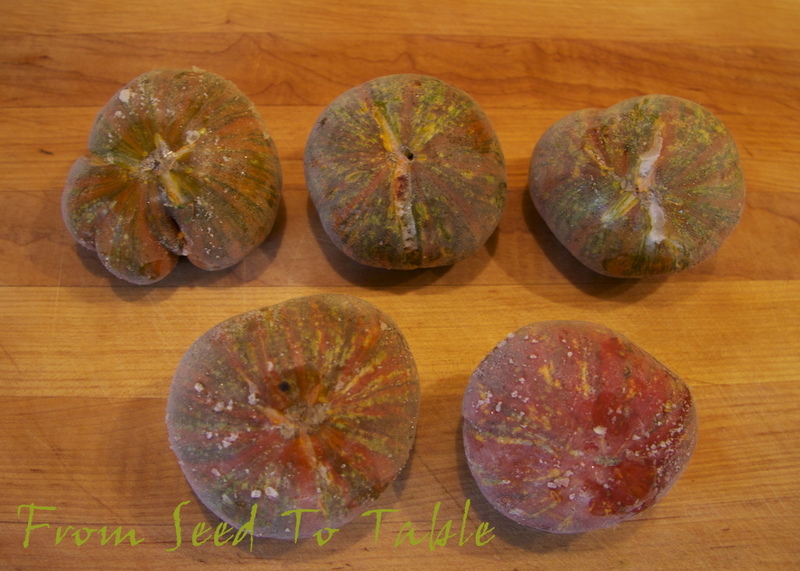 Tossing whole ripe tomatoes into the freezer is not the optimal method for preserving the harvest but it sure beats leaving them to rot because you don't have time to deal with them. The tomatoes were used to make Tomato and Rice Soup. It's easy to peel frozen tomatoes, just hold them under some warm water for a few seconds and the skins slip right off, it might take a few turns under the faucet to loosen all the skin. After sitting out for about an hour the tomatoes soften up enough to chop. I seasoned the soup with some of my ground dried Aji Angelo and Christmas Bell chile peppers, cumin, lemongrass, fish sauce, lime juice, and lots of cilantro. It also included onion, garlic, celery root, and home made chicken stock. I used short grain brown rice and enriched the soup with a bit of coconut milk. My husband declared it a keeper so it's a good thing that I took notes as I made it so I can write up the recipe one day soon. Other than a head of lettuce last week the only other thing that I've harvested in the last couple of weeks is lots of cilantro. I've been weighing it when I pick large bunches, but not every time I harvest it. I tried a recipe for Fresh Cilantro Chutney with Peanuts from Laxmi Hiremath's book The Dance of Spices. It was fabulous, super simple to make, and a great way to use an abundance of cilantro. Basically, you whirl a big bunch of cilantro leaves with a couple of fresh chiles (I used whole frozen chiles), cumin seeds, salt, roasted peanuts, lime juice, a touch of sugar and some water. I served it with some grilled lamb chops - yum! The chutney came out very much like a green salsa but the peanuts were a nice twist on the typical green salsa flavors. A variation of the recipe substituted freshly grated coconut for the peanuts and since I love coconut I'll have to give that a whirl. Here's the harvest totals for the last two weeks. 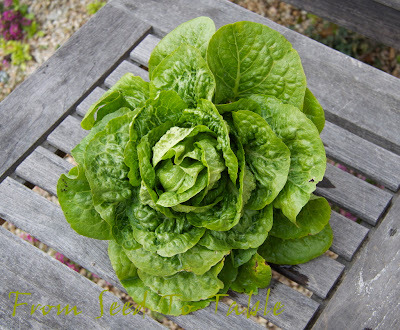 Sweetie Baby Romaine - 14 oz. The total harvests for the year are - 15 lb., 14 oz. 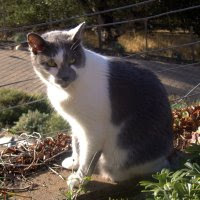 I want to share some of my experiences and observations about pruning caper bushes. I'm no expert on the art and science of pruning capers, what I've learned has come from just doing it, or not, as the case may be. 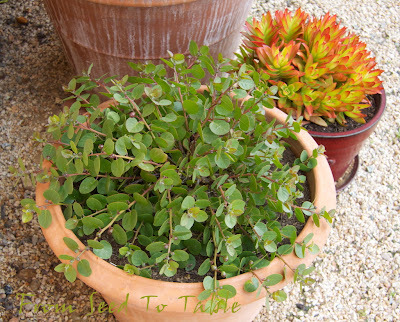 Here's one of my favorite plants, this is the pink flowering bush that is growing in a good sized pot in front of my house. 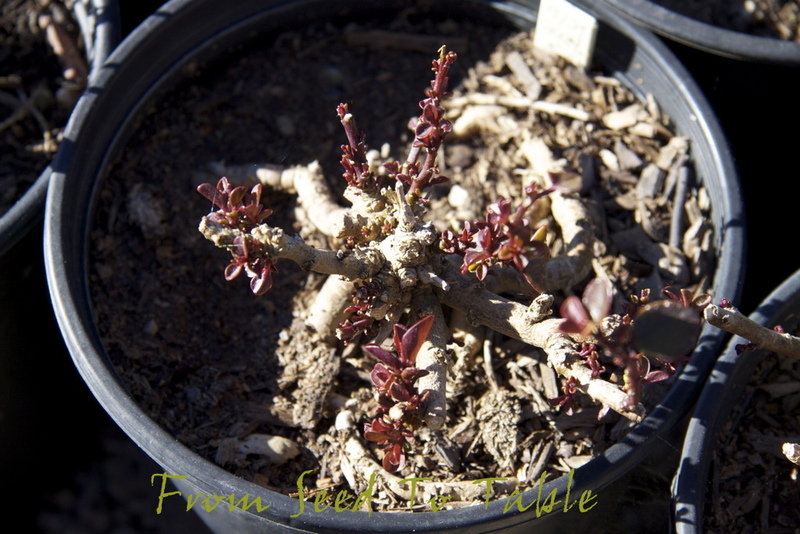 I pruned this one a few weeks ago when it started showing signs of pushing out new growth. 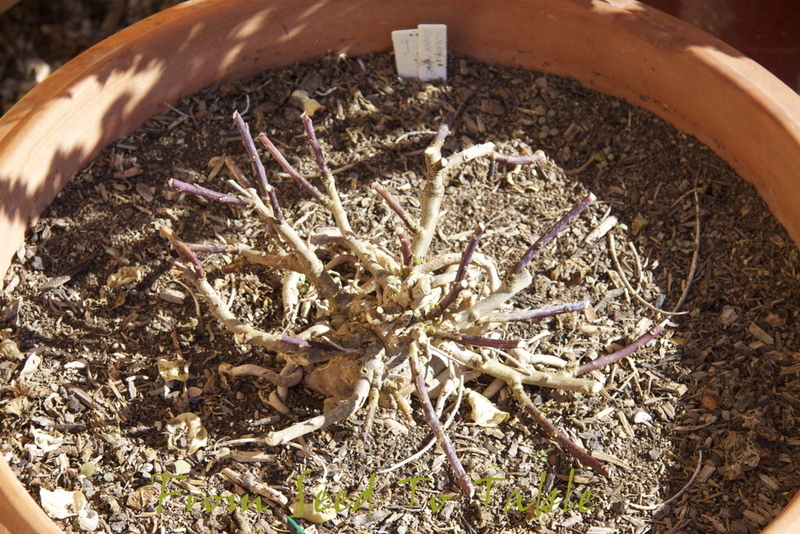 I didn't prune that plant in 2009 and you can see how silly it looks with the scraggly old stems dangling over the edge of the pot. The old stems don't really continue to grow and so they don't produce flower buds. 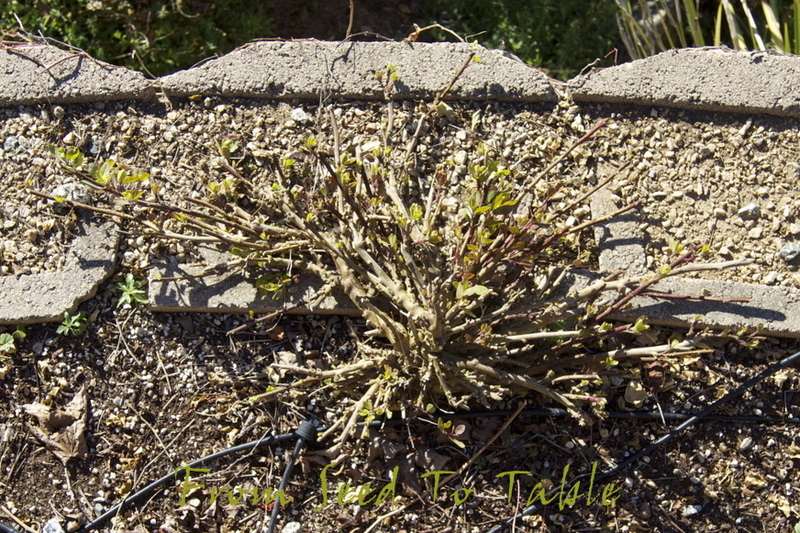 If you cut the old stems back when the plant isn't dormant they die back quite a ways from the cut edge and may wither completely. 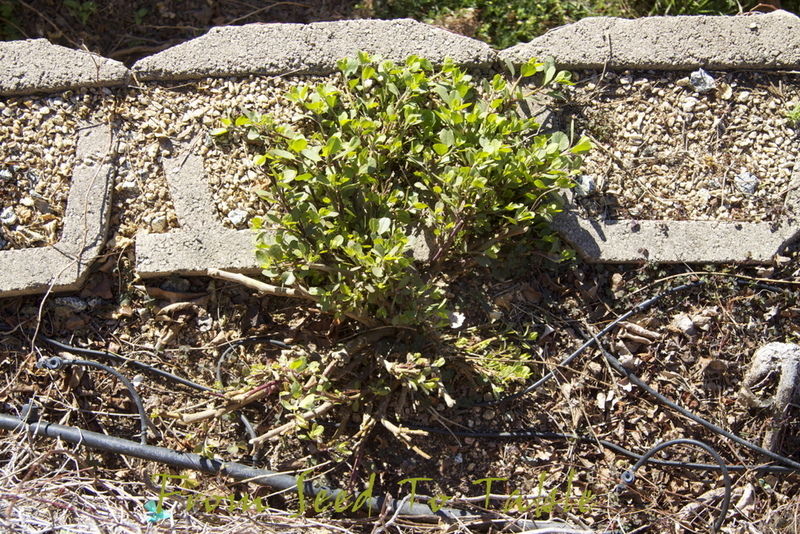 You can see by comparing the May 2009 photo with the May 2010 photo that pruning induces a lot more vigorous new growth from the crown of the plant. If you want to harvest flower buds you want as much vigorous new growth as possible, that's where the flower buds grow. You might think that well, the 2010 plant is a year older so of course it's bigger, but a curious thing I've observed about pot grown caper bushes is that they grow to a size that their confined root systems can support and you can't really force feed them to make them get any larger. One thing that I'm go to experiment with this year is pinching out the tips of vigorous new green growth to try to induce more branching. I know that cutting into woody growth when the plant isn't dormant, whether from previous years growth or new woody growth, makes the stems die back, but I don't know what happens if the stems are cut before they get woody. 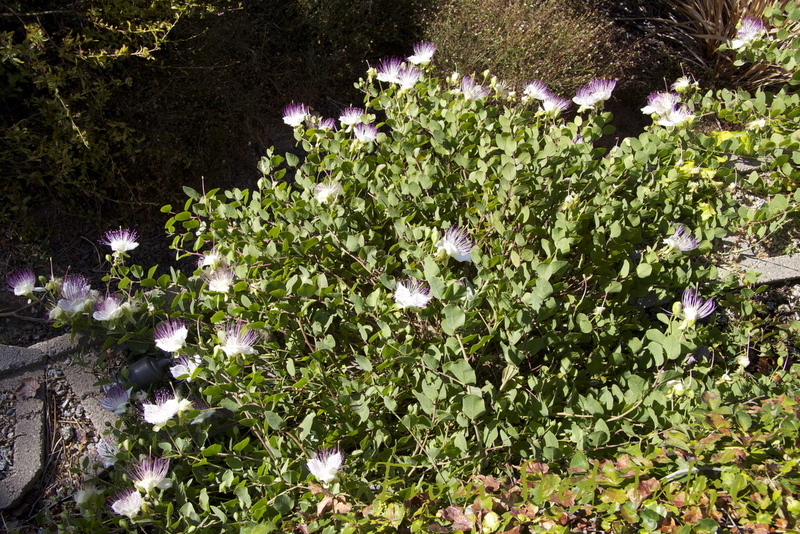 I'm going to try that on one of my potted capers this year. 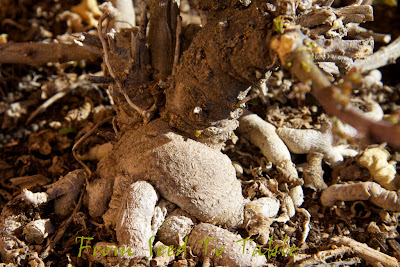 The gnarly thing shown below is one of the oldest plants that I have. I purchased this plant and one other at least 12 years ago, maybe longer (I don't remember exactly when) and they've been growing together in a succession of 3 or 4 pots of increasing size ever since. 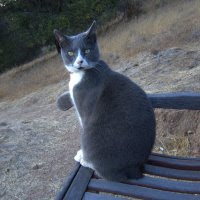 If you click on the photo and look at the very center of it, right at the line of light and shadow you might be able to see the tiny little green bud sprouting from the trunk. 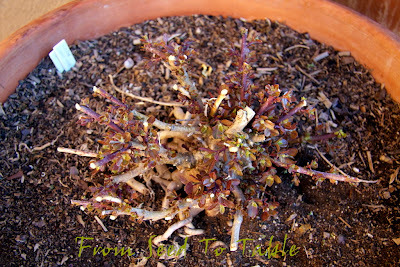 It always amazes me how capers can push fresh new green sprouts out of a woody old trunk or stem. 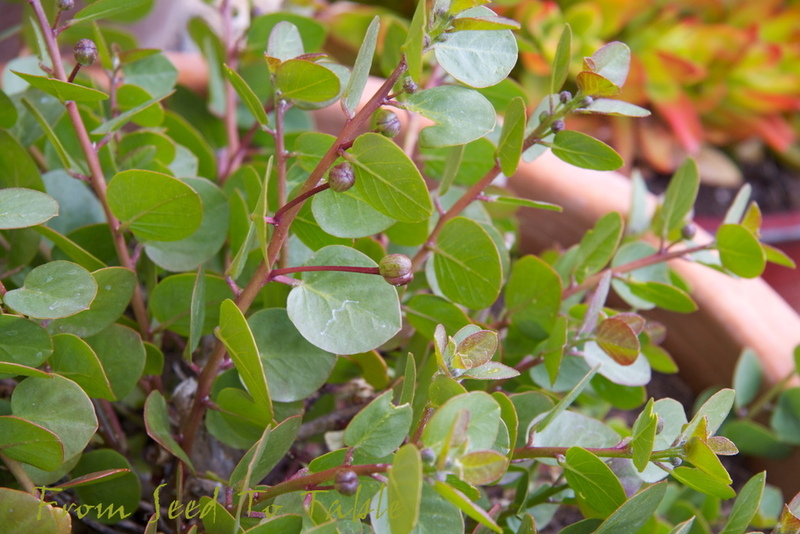 A number of years ago we had a really hard freeze and all of my capers were top killed, it took quite a while for them to sprout new growth and all of it came from just above the soil level, but that year I had the most beautiful bushes ever. I've not had the courage to prune my bushes drastically enough to mimic that frost damage, but ever since then I've been far less timid about giving them a hard pruning, it really makes for a better looking and more productive plant. That's 2 plants in one pot and that's about as big as they get year after year. 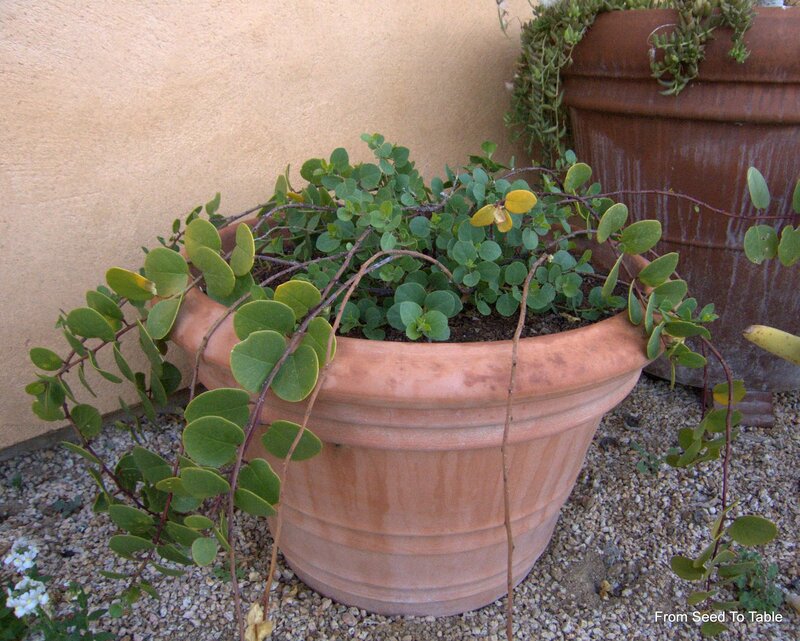 These 2 plants compete with each other too much for either of them to grow vigorously enough to produce a quantity of flower buds. The next two photos are of the most vigorous and productive plants that I'm growing. They are planted at the top of a wall with another wall behind them and face south-southwest. This year they got pruned, although the one below never did go fully dormant and this is what it looked like just after it got pruned. 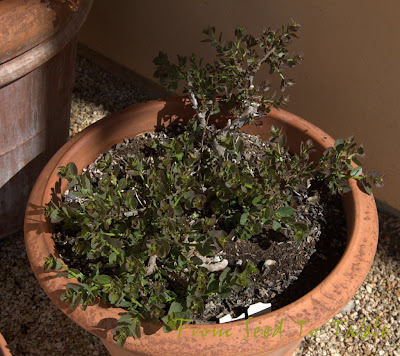 Below is the same plant last year which I didn't get around to pruning since we had a lot of rain which kept this weather wimp indoors when it was time to prune. It still grew like crazy and was already producing flowers in March. 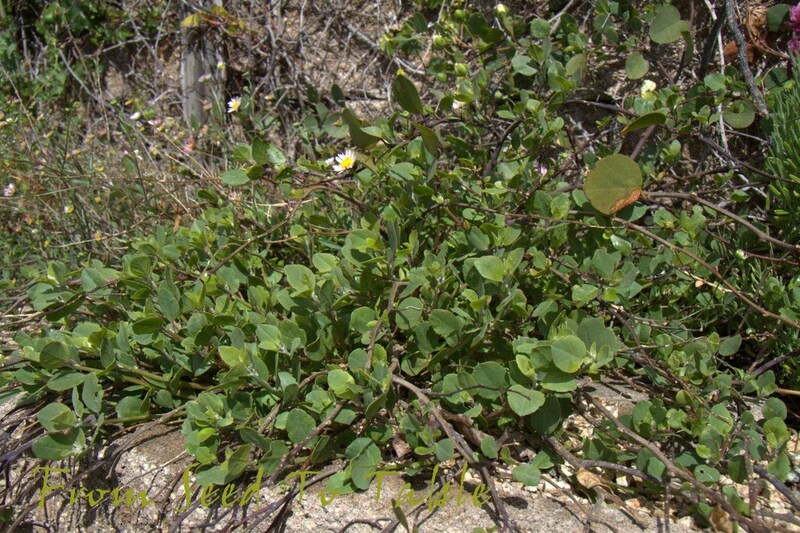 Actually, this plant continues to produce a few flowers all through the winter if left unpruned. It faces full south and the stems that hug the wall behind stay green and keep producing a few flower buds through the winter even though some parts of the plants that are more exposed get crispy from the occasional hard frost. The plants growing in the ground will still grow like crazy even if they aren't pruned and have been growing larger every year, but they look a lot prettier when they grow back from a hard pruning. It's hard to see in the photo below but there are a few mangy looking stems trailing over the edge of the wall. Like on the potted plants, the old stems didn't continue to grow much and didn't produce very many buds. Here's the same plant after I stopped harvesting the buds and just let the plants bloom. 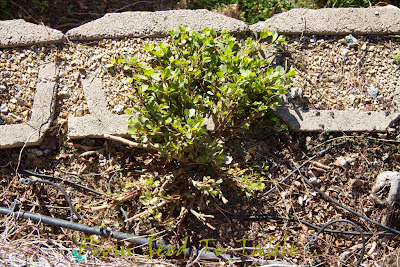 The bush may have grown even larger if the deer hadn't trampled it a few times, they can get on top of the wall and like to browse on the ivy that is growing there. 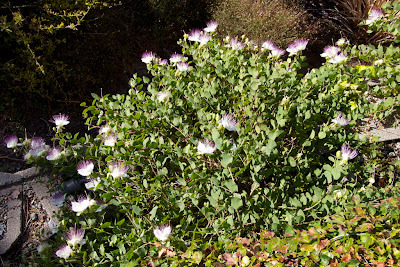 Here's one last example of my caper pruning. I've got a lot of plants growing in 1-gallon pots. 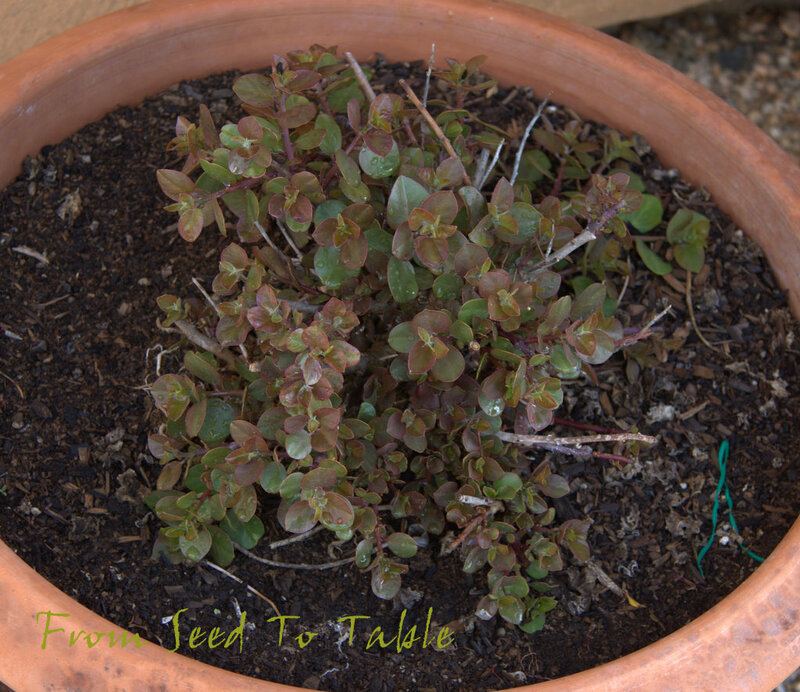 Some of them have been stuck in their pots for something like 6 or 7 years as I continue to experiment with growing them in various spots in the ground around the garden. It's amazing how well they get along sitting in their little pots year after year. I've had some promising starts with putting a few plants in various spots around the garden only to have the deer trample them. 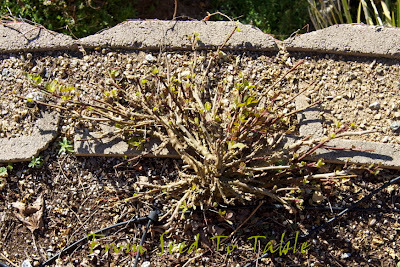 There have been some dismal failures as well with plants refusing to grow or just simply shrinking down to nothing. 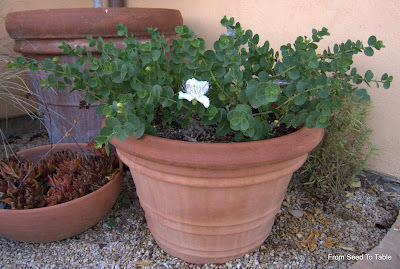 But the amazing thing is how a little pot bound plant can take off when it is planted in the right situation. I've got a few new promising experiments out in the garden even now so I hope to be able to report on them later this year. 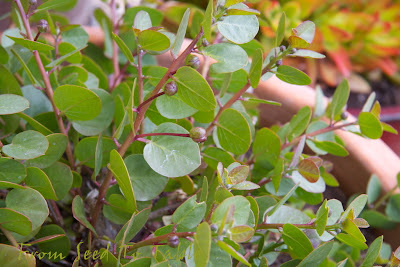 I would love to hear about your experiences growing capers, leave a comment or send me an email. Let's learn from each other! It was another week of very light harvests. 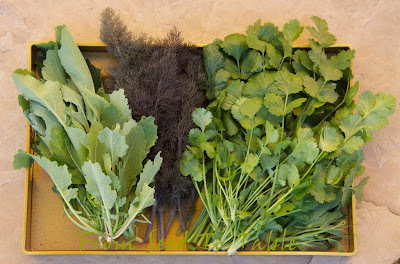 I finished thinning the Couve Tronchuda and started thinning the Olive Leaf Rapini - that was the bulk of the harvests and the only veggies that I added to the harvest tally. The Rapini is on the left and I also harvested the tenderest tops of some of the Red Florence Fennel that is volunteering around the garden, plus some cilantro, and in the bottom right corner the tops of a few Super Sugar Snap Peas. The fennel, most of the cilantro, and the pea greens were used in an herbed skillet souffle. I'm still making good use of previous harvests. Some of the Marina di Chioggia squash that I cut into the week before last was sliced and pan sauteed and served with a Garlic Agrodolce sauce (sauteed sliced garlic, sugar, white wine vinegar and a touch each of cinnamon and vanilla, and crushed dried oregano - fresh mint is good also if you happen to have some). And some the of celery root that was harvested long ago and that is keeping quite well in the fridge was combined with some fingerling potatoes to make Potato Smashers or in this case Celery Root & Potato Smashers. I served the Smashers with Shredded Sauteed Brussels Sprouts (seasoned with sweet onion, zante currants, pine nuts, crumbled dried peppers, and pomegranate balsamico). I served the Brussels Sprouts on the side instead of folding them into the smashers. And I'm still working my way through the Romanesco Broccoli, some of it was pan browned with some sweet onion slivers and capers, then braised with chicken stock and chopped Couve Tronchuda. That was combined with whole wheat penne and some crunchy sauteed breadcrumbs seasoned with crumbled dried peppers and oregano. Couve Tronchuda - 6.5 oz. Olive Leaf Rapini - 3.25 oz. The total for the week was - 9.75 oz. The total for the year is 14 lb., 5.75 oz. Definitely the best looking head of the four that I harvested this season. 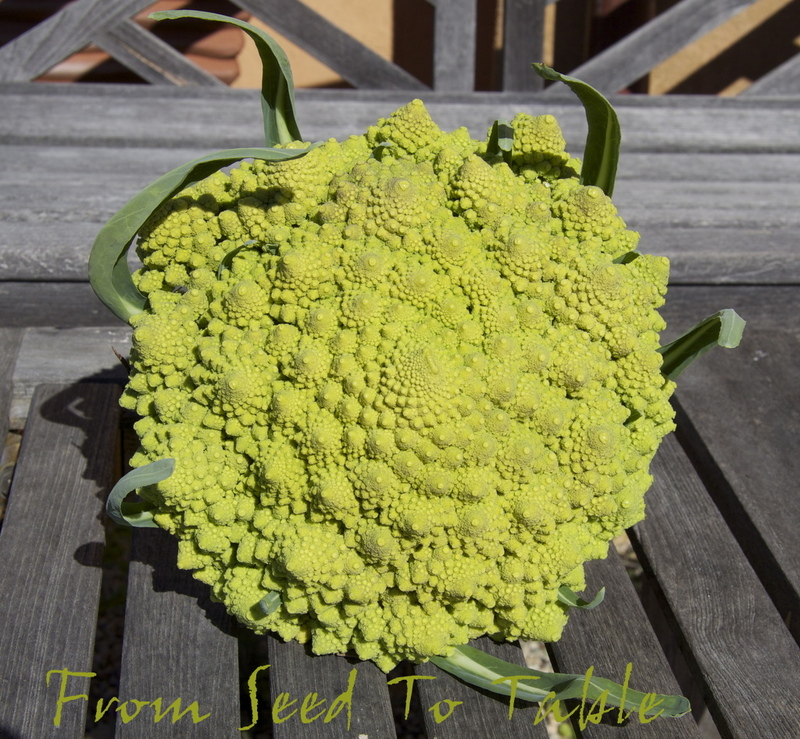 And the first of the Couve Tronchuda, or Portuguese Cabbage. This was the thinnings of the winter sown plants. 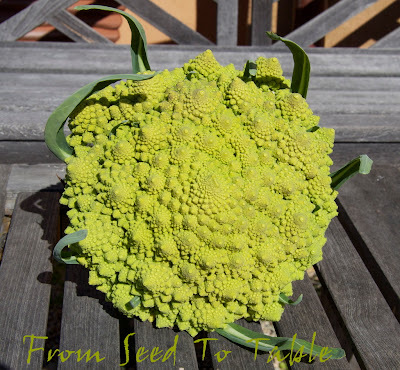 I used some of the previously harvested Romanesco in a Thai inspired coconut curry that also included snow peas from the freezer, cubes of the big Marina di Chioggia squash that I harvested last fall, plus a generous amount of cilantro from the garden. 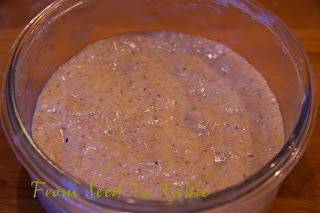 The Couve Tronchuda went into another version my new favorite celery root and farro soup. The Couve Tronchuda is tender enough to be added to the soup directly at the end of the cooking. I shredded the leaves finely to insure that they would cook quickly. Golden Corn Salad - 2.25 oz. 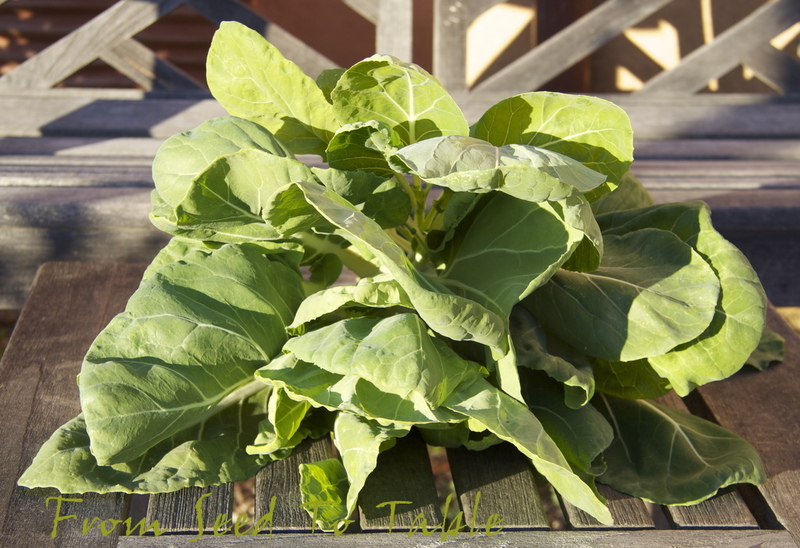 Portuguese Dairyman's kale - 10 oz. Couve Tronchuda - 12 oz. 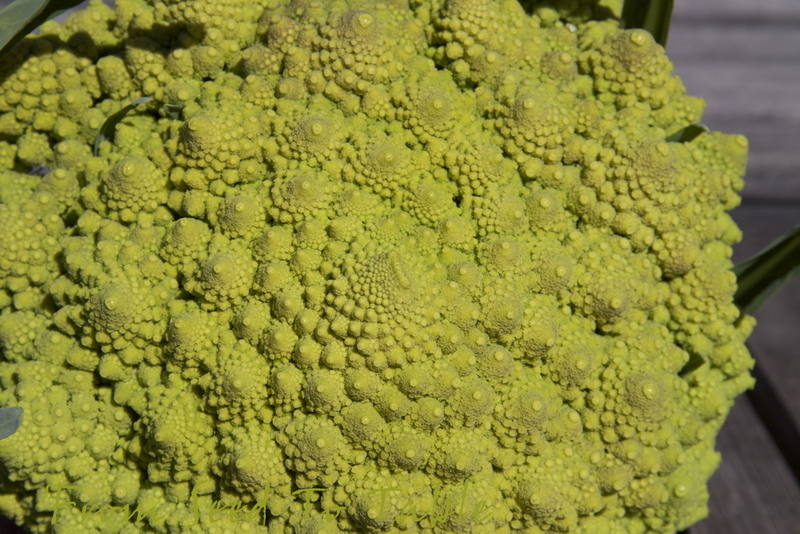 Romanesco broccoli - 3 lb., 8 oz. The total for the week was - 5 lb., .25 oz. The totals for the year are - 13 lb., 12 oz. Harvest Monday is hosted by Daphne on her blog Daphne's Dandelions. 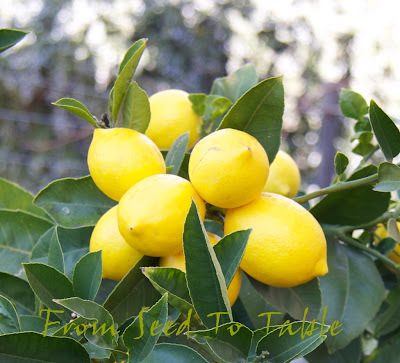 Head on over there to see more of what other garden bloggers are harvesting. Meyer Lemon season is getting into full swing here. 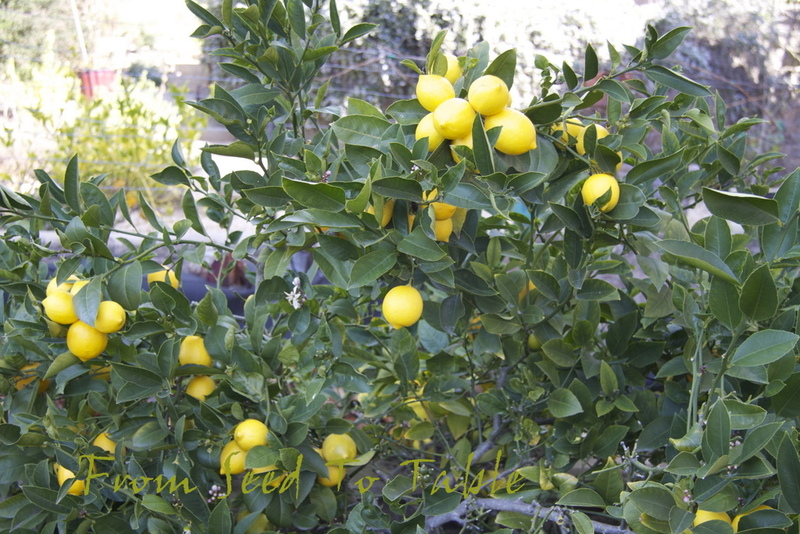 My tree produces ripe lemons year round but the bulk of the lemons ripen in the winter. Today I picked a dozen of them and made a batch of Meyer Lemon Curd. 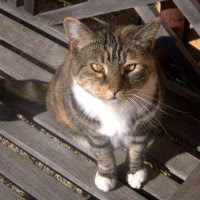 Thomas will probably be shocked to learn that I didn't have time to deal with the beautiful peels which are even now sitting in the compost bowl. If you are a follower of Thomas's blog A Growing Tradition (you should be), then you will have seen his wonderful breads. To join in that fun I'm showing off some of my own bread baking efforts. First, my starter. 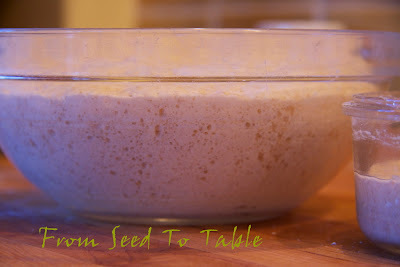 Henrietta is a 100% hydration 50/50 white and whole wheat starter that I started about a year ago following a recipe I found on the LA Times website. I had been trying to get a good starter going for years, more years than I want to admit to, and this formula produced the best starter I've ever made. The bread from that article is fantastic also. That's a shot of Henrietta at 12 hours after her last feeding. 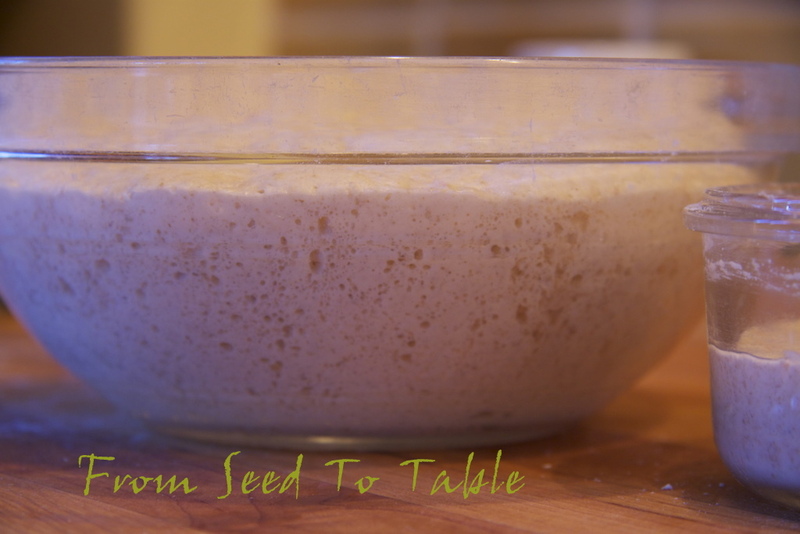 And below, next to her is the starter for a batch of whole wheat levain bread, 12 hours old and ready to be used to seed the final dough. 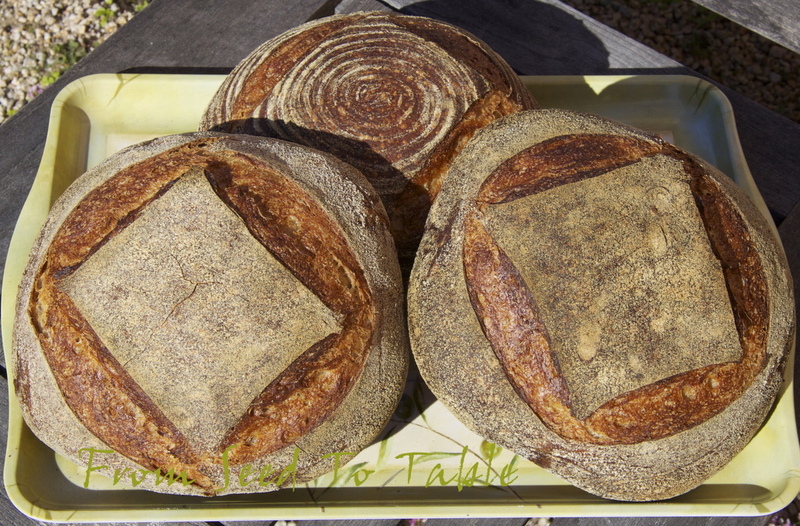 This was last week's bake, three loaves of whole wheat leavain breads. I have 2 linen lined baskets and one willow basket for making loaves this size. 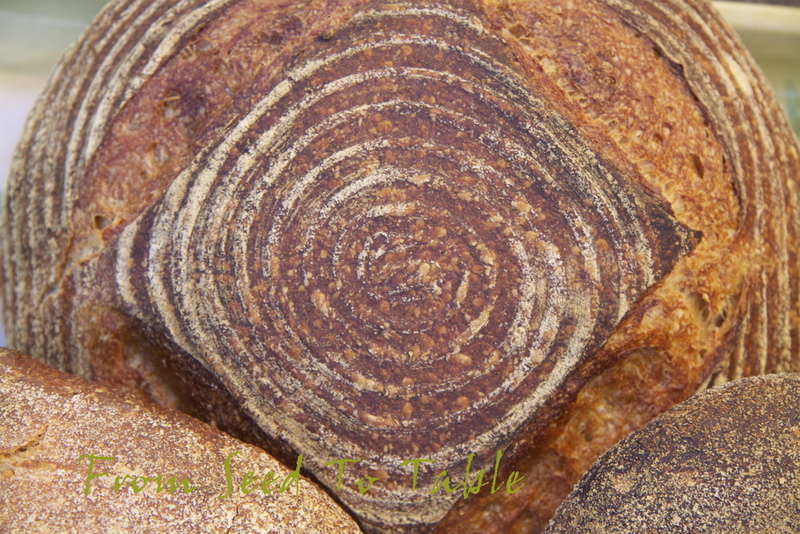 You can see what a pretty pattern the willow basket leaves on the surface of the loaf. 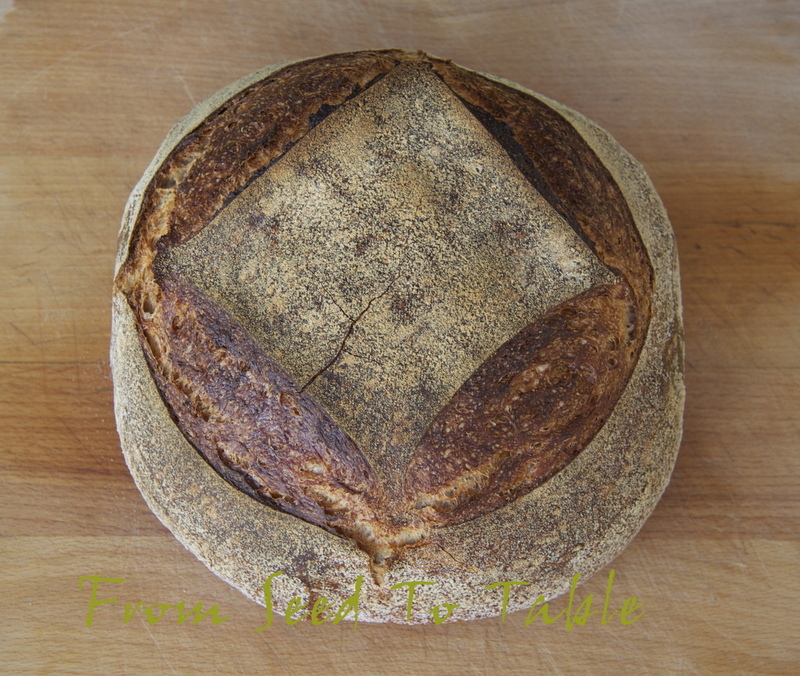 And this was today's loaf, only one loaf of a different formula whole wheat levain. Stay warm! Have a nice hot bowl of soup and a chunk of good bread, that should do it.